DUBLIN, IRELAND--(Marketwire - Mar 15, 2013) - Much like the ball dropping in New York City on New Year's Eve, the 2013 St. Patrick's Day season around the world began today when the first pint of Guinness® was pulled at the Guinness Storehouse®, Ireland's No. 1 international visitor attraction, by Guinness® Master Brewer Fergal Murray. A count-down leading up to the inaugural ritual marked the beginning of holiday celebrations leading into the weekend ahead of St. Patrick's Day. In conjunction with the celebration, Guinness Storehouse announced a list of exciting St. Patrick's Day and Irish-themed festivities throughout March 15-17 to celebrate this national Irish holiday and spread the cheer worldwide. As the global hub of all St. Patrick's Day celebrations and home of Guinness, the Guinness Storehouse is opening its doors for the weekend to offer revelers an exciting line-up of Irish-infused entertainment and festivities throughout the seven-story building. Throughout the weekend, the Guinness Storehouse will offer a variety of entertainment, a traditional Irish dance show and much more. More than a dozen music acts will add festive Irish music to the party atmosphere, while legal drinking age Guinness pint sippers enjoy panoramic 360-degree views in the Gravity® Bar on the seventh floor, the highest viewpoint throughout Dublin. Starting today and continuing through St. Patrick's Day, Guinness Storehouse visitors will enjoy a new Guinness experience standing inside the world's largest pint glass while viewing a flowing green waterfall, specially colored for the occasion. As usual, all legal drinking age Guinness Storehouse visitors receive a complimentary pint of Guinness during their visit. "The most authentic way to celebrate St. Patrick's Day is to visit the Guinness Storehouse in Dublin, the global capital of St. Patrick's Day," said Lisa Fitzsimons, Marketing and Sales Manager, Guinness Storehouse. 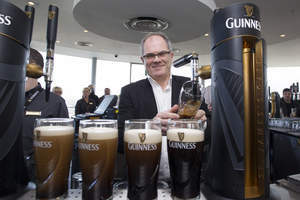 "The inaugural first pint of Guinness being pulled at the Guinness Storehouse has started St. Patrick's Day celebrations heading into the holiday weekend." All those by the name of Patrick, and variants of the name, who visit the Guinness Storehouse on St. Patrick's Day will receive free Guinness Storehouse entry to enjoy the festival. Upon arrival, all Patricks will receive a VIP (Very Important Patrick) Pass, which provides them with free entry to the Guinness Storehouse. The ultimate St. Patrick's Day experience at the Guinness Storehouse cost EUR 14.70 (approximately USD$19.11), and those who purchase a ticket online at www.guinness-storehouse.com can also obtain a 10% discount. Guinness reminds everyone to celebrate responsibly and to always drink in moderation. In the global spirit of St. Patrick's Day, the Guinness Storehouse will provide the setting where five mayors and other leaders from cities and towns in the U.S. named "Dublin" will be hosted by the Lord Mayor of Dublin, Naoise O Muiri. Joining the Lord Mayor will be Tim Sbranti, Mayor of Dublin City, California; Timothy A. Lecklider, Mayor of Dublin City, Ohio; Jeff Croft, Chairman of the Board of Supervisors, Dublin Township in Fulton County, Pennsylvania; Phil Best, and Mayor of Dublin City in Laurens County, Georgia. For full terms and conditions and details of the Guinness Storehouse St. Patrick's Day Festival go to www.guinness-storehouse.com and check out their Facebook page at www.facebook.com/guinnessstorehouse. Guinness Storehouse is Ireland's number-one visitor attraction, providing an unforgettable welcome and a magical journal deep into the heart of the world famous Guinness brand and company. This historical building is central to Dublin's and Ireland's heritage, and has been continually updated to create a blend of fascinating industrial tradition with a contemporary edge. The seven floors bring to life the rich heritage of Guinness, telling the story from its origins at St. James's Gate in Dublin to its growth as a global brand, known all around the world. The Guinness Storehouse is also home to the Guinness Flagship Retail Store, packed with unique and exclusive merchandise and memorabilia. The Guinness Storehouse experience comes complete with the world's largest pint glass which would hold 14.3 million pints of Guinness, Guinness memorabilia, and Gravity Bar, offering 360-degree views of Dublin and beyond from the seventh floor. The newest addition is the Guinness Connoisseur Bar, where visitors can learn how to appropriate taste Guinness variants and beer-tasting vernacular. Visitors will be able to witness experiential exhibits featuring the ingredients and the craft of brewing Guinness, the artistry of transporting Guinness around the globe, the iconic Guinness advertising that has made Guinness a favorite Irish brand across many continents, food infused with Guinness, and the art of pouring of a Guinness pint. For more information, go to www.guinness-storehouse.com. The GUINNESS, GUINNESS STOREHOUSE and GRAVITY words and associated logos are trademarks.